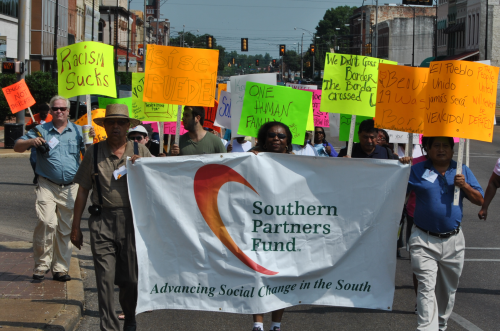 Southern Partners Fund's (SPF) mission is to serve rural Southeastern communities and organizations seeking social, economic, and environmental justice by providing them with financial resources, technical assistance and training, and access to systems of information and power. How do you do your funding? How it is different from conventional philanthropy? Our members are experts on the needs of grassroots communities, because they are part of these communities. As practitioners in the field, they are appointed by other members to sit on a review committee and are charged with making the decision about where to appropriately place resources. For example, we worked with a small grassroots organization in North Carolina whose goals were to hold elected officials accountable for the unjust detentions and deportations happening in their community. While this organization garnered a lot of local support, it was hard for them to compete with more established, state-wide organizations. SPF’s membership (the governing body) understood the impact a local organization can have in its community. We took the time to visit the community, meet its leadership and listen to their story. In their own language, they spoke passionately about the needs of their community and their need to grow their leadership to fight the injustices they faced. How did your organization come to practice philanthropy in this way? Were you influenced by another organization, model, or funding philosophy? It took five years to get from the invitation to the group of 18, to an operating, grantmaking public foundation. So, what did we do for five years? Besides spending time learning how to structure and operate a foundation, we also learned how to honor and include the unique experiences that each person brought to the process. We learned the power of telling our own stories. We learned that each person’s knowledge was a piece of the quilt that made the foundation whole. We came to understand that each voice mattered. All of these insights were carefully crafted into building Southern Partners Fund, allowing us to create an entity that engages the full humanity and creativity of grassroots communities. Have you ever been met with criticism when using this type of funding? How did you respond? The criticism around the work of the foundation has focused on SPF’s capacity to fund 12 states in the South. Our response to this has been simple. Our investments equal impact. Even if the resources are spread thin, they benefit the most disadvantaged. We have seen evidence that even the smallest investments in rural counties have been real catalysts for change. Tell us about a challenge you feel you’ve had in your work that has the most lessons for other funders. Our work calls for an organizational paradigm shift. We had to ask ourselves the tough questions. Can we still maintain a collective, community-based grounded culture, while dealing with millions of dollars? Can we lift up the values and expertise of grassroots leaders while having to function within a more conventional and corporate-structured world? We had to think about creating a new philanthropic culture. We had to open the minds of funders to other possibilities. We realized people in communities across the rural South have the right to self-determination and control over resources.Our most important lesson was that culture is central. It is the soul of our work. It’s the important resource. We could not neglect culture, for when it is neglected, our potential, as well as the processes for growth and success, are hindered. We came to understand that without this fundamental piece — the “who, what, and why” — our work would suffer. Through this democratic model of philanthropy grassroots, community based organizations have the opportunity to build their capacity to realize their visions for rural communities across the Southeast. Strong, accountable and sustainable relationships are formed between community leaders and philanthropic sector. Neighborhood leaders become the powerbrokers in their community. They are not just sitting at the table, they are creating the tables of change and putting resources into areas where it is most needed. The community is in control. This strategy takes time and patience. Community members need to have the time to think through what they want to do, how to care for the resources, and how to manage assets. However, when we take the time our work is more effective. Putting the power in the hands of communities can dramatically shift the balance of power. This matters because the community drives the foundation, and this is a new model of philanthropy. Our model is deeply rooted in the fabric of the rural South. SPF’s relationships with our members and grantee partners allow us the opportunity to bring the voices and stories of community into spaces that don’t exist in traditional philanthropy. To hold this, and to be accountable to it, changes the institutions and all the people connected to it.